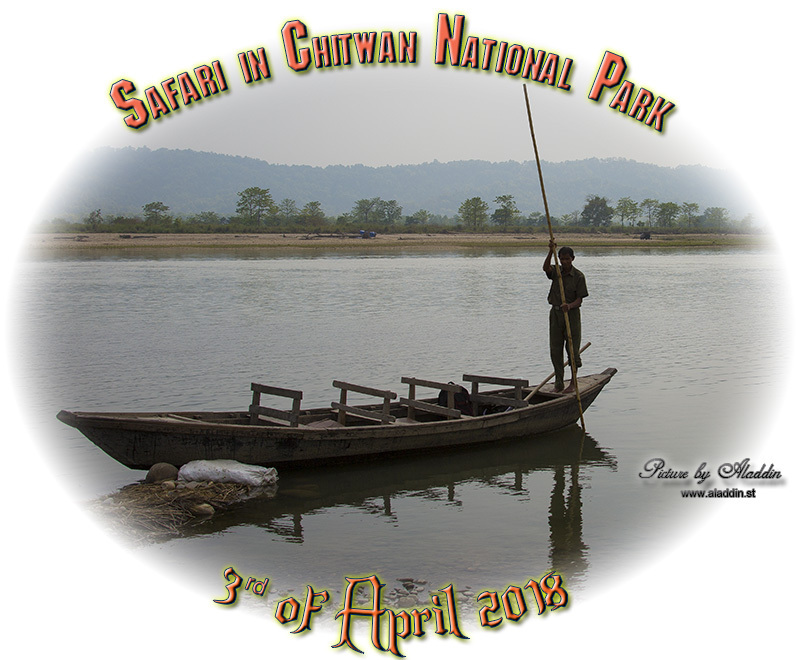 Tuesday 3rd of April 2018 and we left the Tiger Tops Tharu Lodge and we were at Gandaki River 10 to 15 minutes later. No sign of any gharial crocodiles now. We got in to the boat and we crossed the river to the waiting jeep. Afternoon and it was much more comfortable during the cool afternoon. 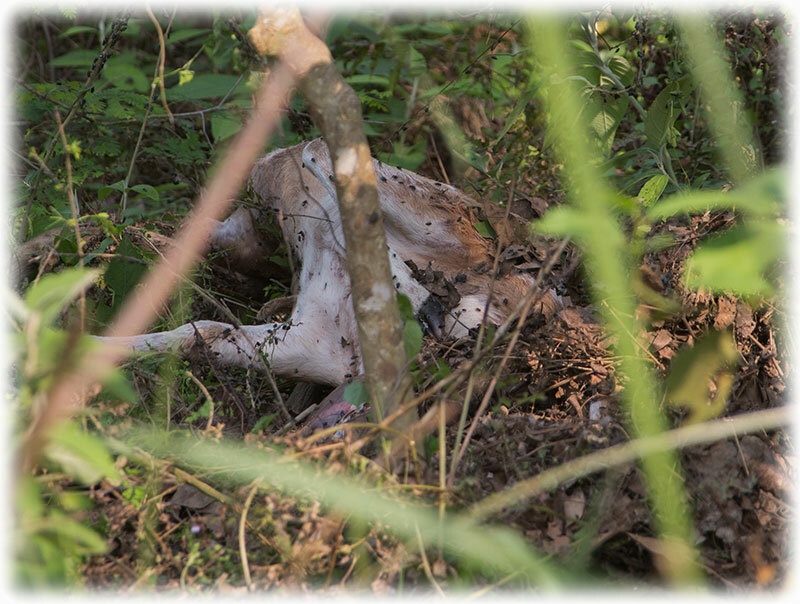 We reached the forest and we found a dead male spotted deer, killed by a tiger. We stopped to have a look and my Guide and driver went out to have a look. I asked if they were crazy. 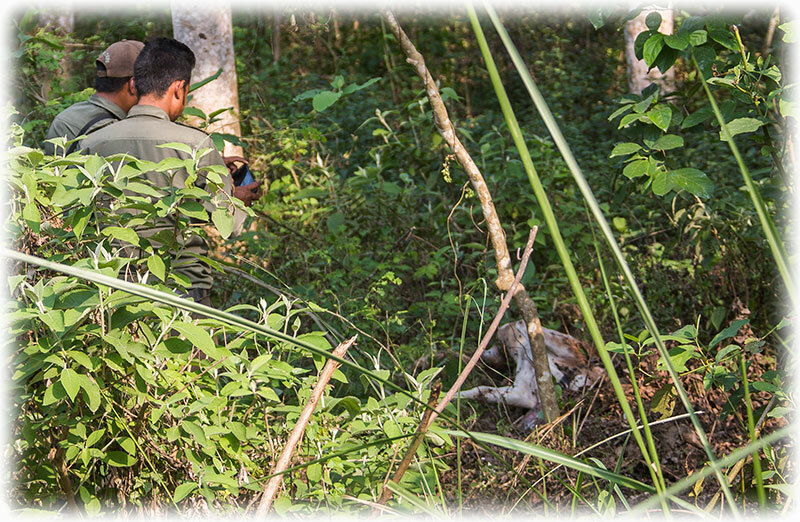 A dead animal, killed by a tiger, so for sure the tiger was close by keeping an eye on the dead deer. A tiger have success one out of 10 or 20 time to catch and kill the prey. 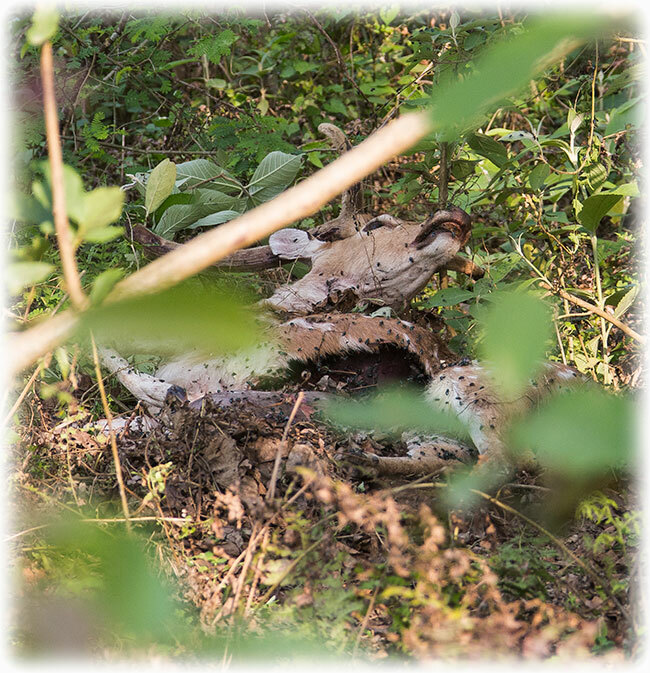 So for sure, the half-eaten deer won't be spoiled and the tiger is most likely around resting keeping an eye on the food so no one come to steal the deer. 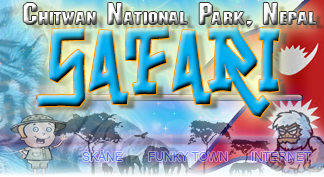 We continue our safari, but we will come back here again. Just to go check out a water hole to see if we can find the tiger. The tiger might be thirsty after the meal, we will come back here again to see if we can see the tiger. 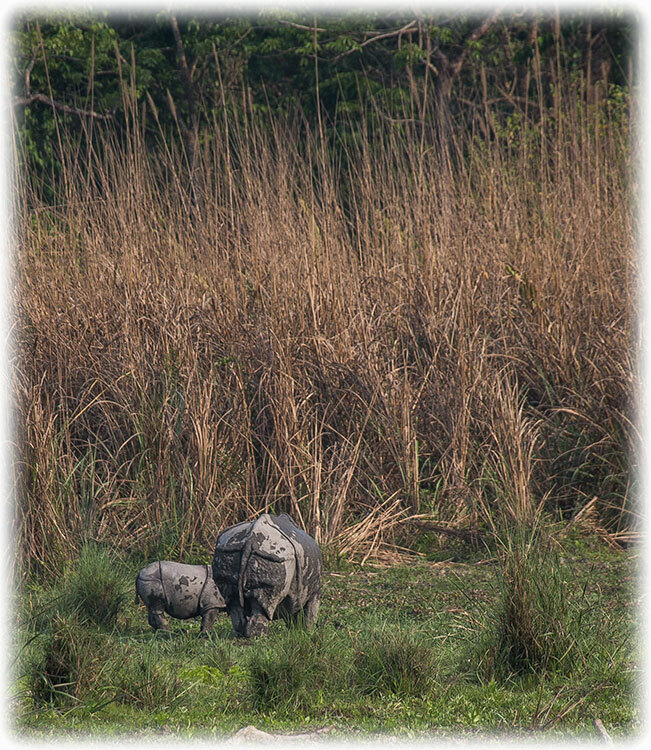 We drive to the water hole closest to the dead deer, but no sign of any tigers. 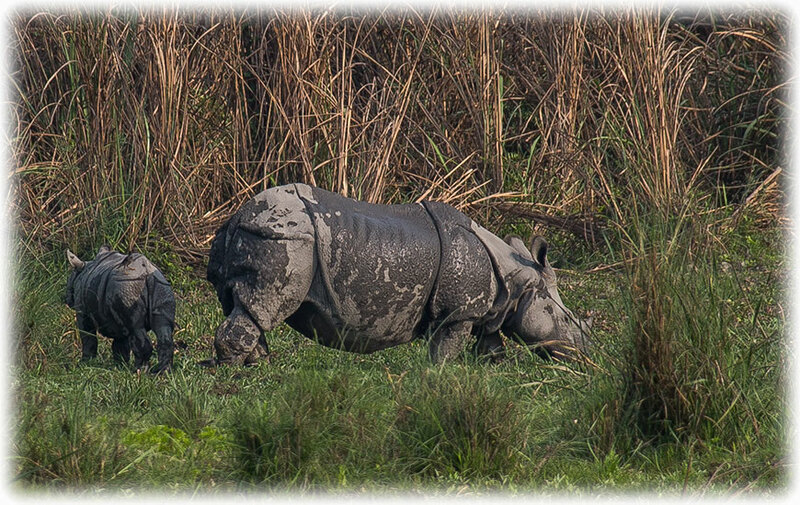 But we see a baby Rhino eating in the grass land, but too far away for any good pictures. We leave the water hole and we drive back to the dead deer. We discover that the deer have been moved during the 10 minutes we have been away. Most likely by the tiger that want to drag the food away from the dirt road but have been scared by a passing jeep. 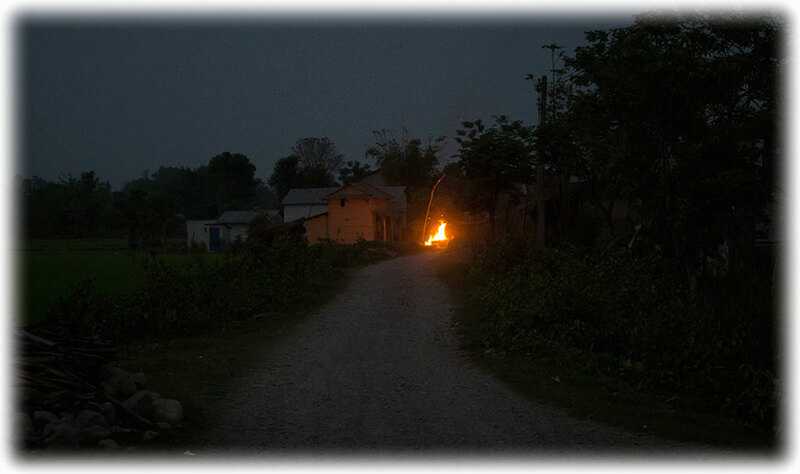 We decide to stay here to see if the tiger comes out, now we know for sure that the tiger is close by. 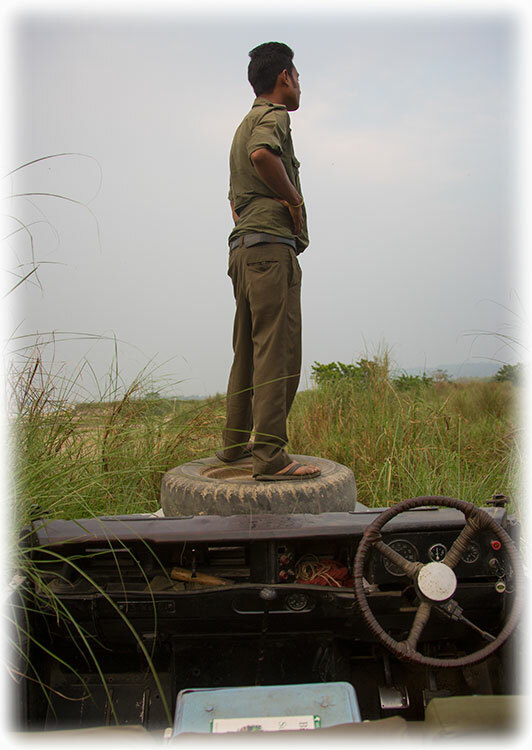 So the plan is to park the jeep and to sit still to get the tiger to come out when it is used to us. But the tiger don't show up and we decide to leave for a while having a look at other things. We take off and we drive through the forest until we arrive to yet another waterhole. 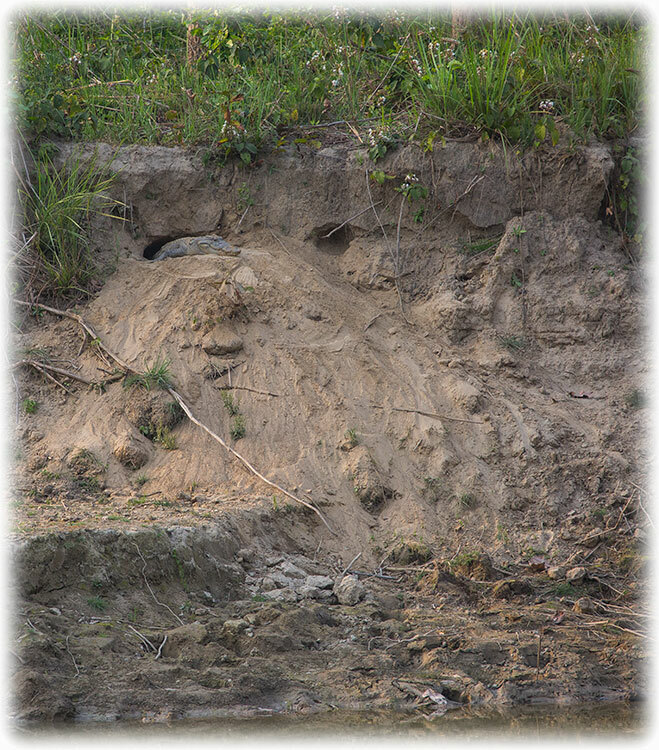 We see a crocodile that have climbed high up in to a hole to lay the eggs. 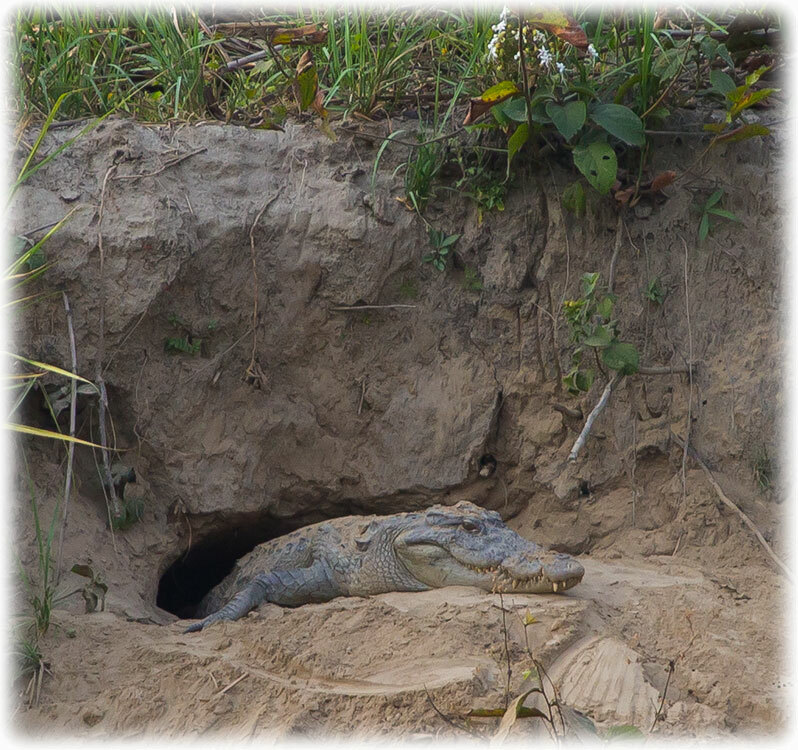 So there will soon be new crocodile babies in the Chitwan National Park. Many of the babies will not survive as they will be eaten by other animals. But some of them will make it and you might see them if you come here. We're back to look for the dead deer, but now the deer is gone. 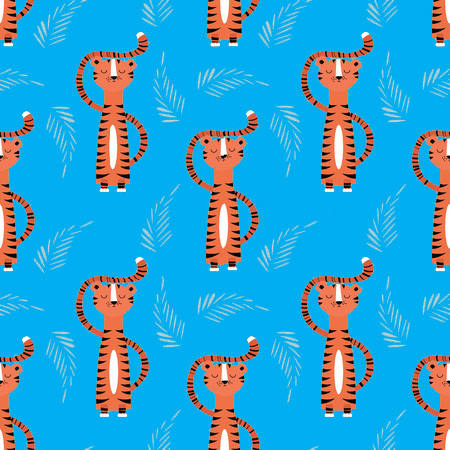 The tiger have pulled the deer in to the bushes and we cannot see it anymore. But we can hear the flies so we know that the deer is there. The tiger took the opportunity to move the food while we were away. 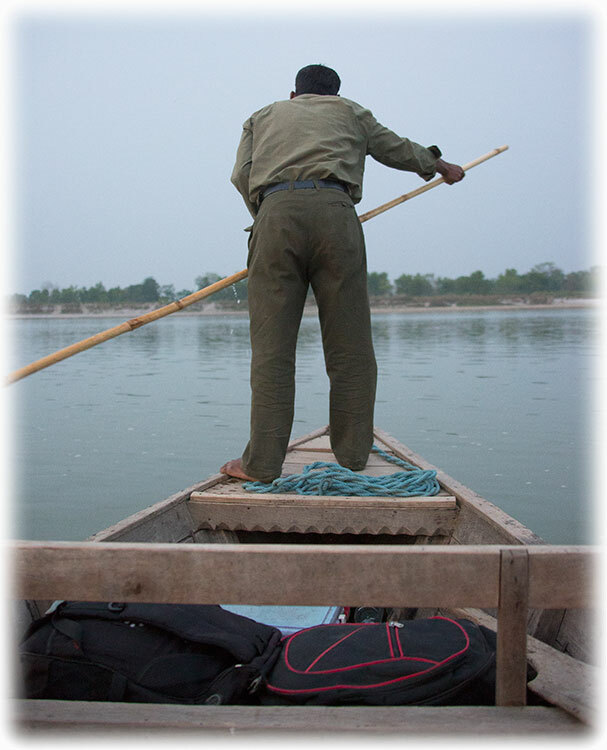 Time had turned quickly so it was time to return to the boat so we would make it across the Gandaki River before it got dark. We spotted fresh tiger tracks not far away from the boat. The tiger had crossed the dirt road just recently as the tracks was done after that we had arrived and the tracks lead in to the grass between the dirt road and the river. We found a small dirt path through the high grass along the river. We drove as long as we could on this path. 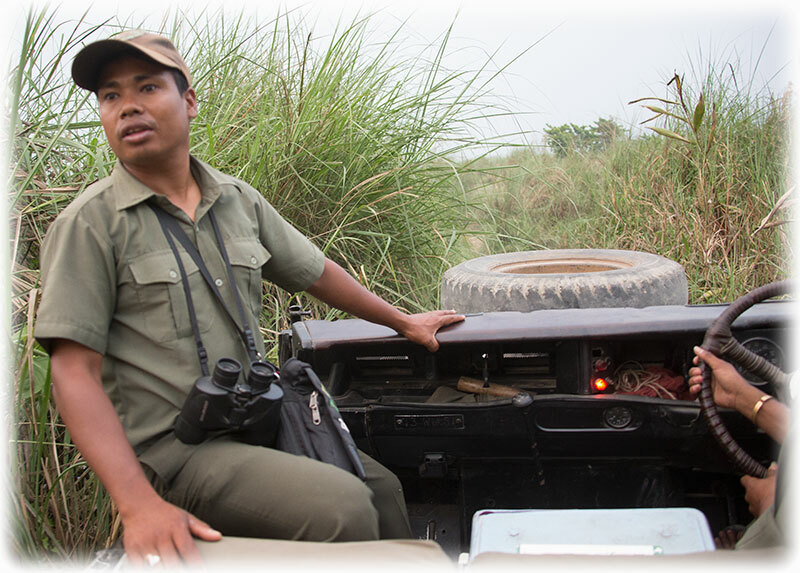 When we could not drive any longer my Guide went out of the jeep to go look for the tiger. I stayed in the jeep, for sure I didn't feel like running in to a tiger in the grass. 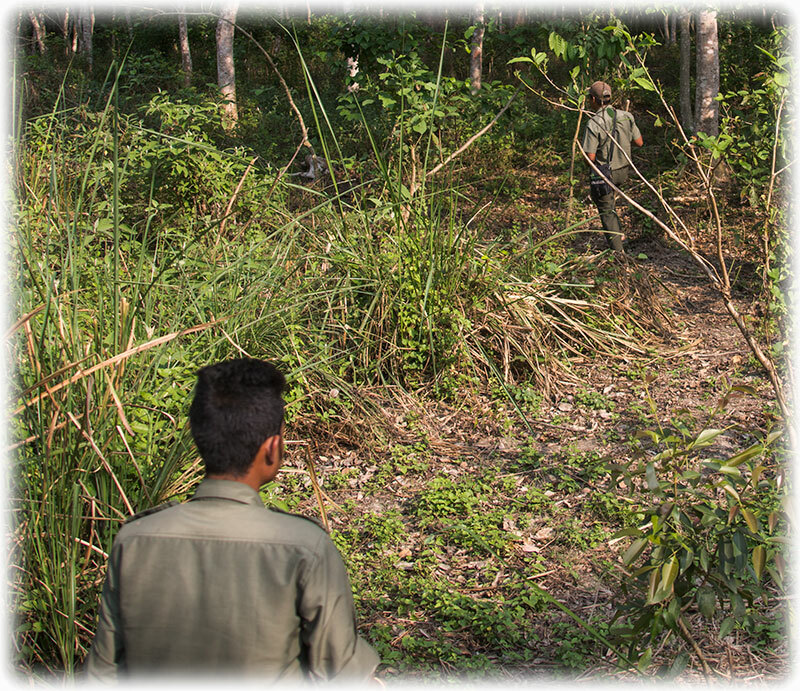 We never found any tiger and now we had to try to get back out from the grass land again. Dinner and I was off to bed. 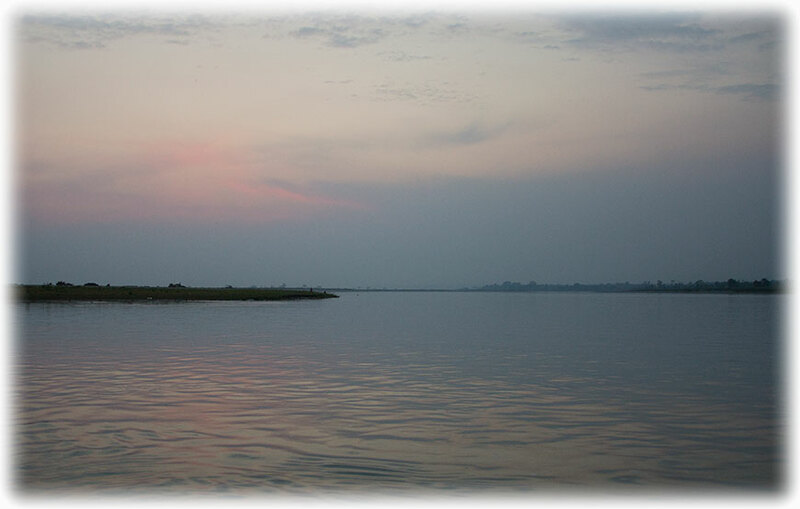 I will spend tomorrow morning looking for birds around the hotel and in the afternoon I will go for my last safari here in Chitwan. So tomorrow is the last chance to see any tigers or leopards. Click HERE to find out if we have any luck.